I've just recently started to learn Auto Layout after deciding that I had put it off for too long. I wanted to make a horizontal UIScrollView containing buttons, but I found it quite difficult to find a good tutorial online for using a UIScrollView with Auto Layout. So here's where some of the magic happens. Instead of adding your views directly to the UIScrollView, we're going to add a 'View' from the Object Library in the right hand toolbar to be our Content View. This is going to make your life much much easier and i'll explain why shortly. I've made our Content View green so it's easier to see. Again, as in step two, click on our Content View, then on the 'Pin' button and add 4 constraints for leading, top, trailing, bottom and height and width constraints. Read that again, it's important. 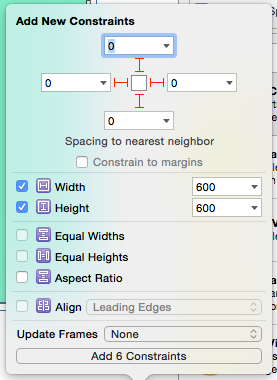 Height and width constraint. Add them. Thanks. 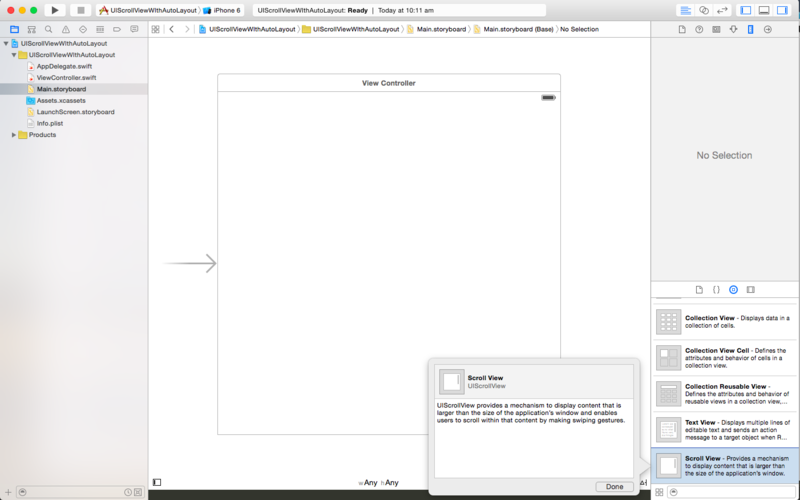 This pins our Content View to all edges of our UIScrollView. 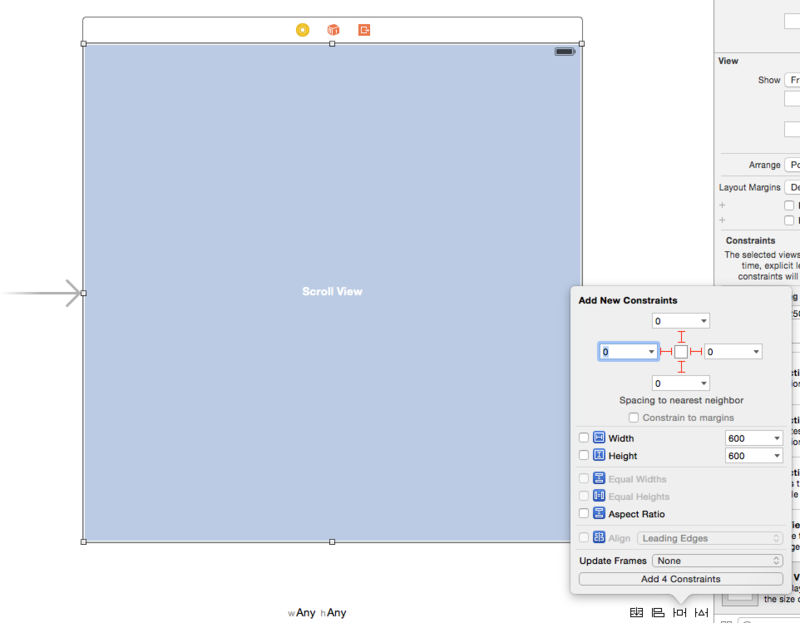 Now seems like a good time to explain how UIScrollView and Auto Layout work together. 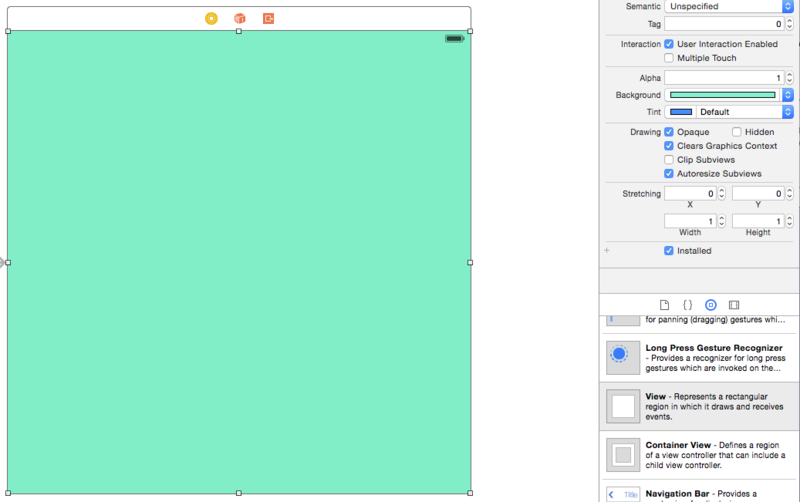 Basically, UIScrollView works differently than how a normal view typically behaves when it comes to Auto Layout. 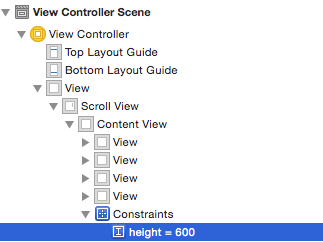 When we pinned the UIScrollView to our top level view's edges in Step 2, we're saying "Our UIScrollView's visible area should pinned directly to our top level view's edges" but these are not our content view's constraints (read: what's inside our UIScrollView). So you're probably thinking "Wait, if we've pinned our Content View's edges in Step 3 to our UIScrollView's edges, doesn't that mean that our Content View will always be the same size as our UIScrollView and never actually scroll?" Astutely noticed good sir (or madam), but actually because our Content View has a constraint that says it's 600px wide, and when we run our app on the simulator the UIScrollView will only be the width of our screen (which is < 600px) the UIScrollView will be able to scroll! How does Auto Layout know how big my contentSize is? Auto Layout will figure out the width and height of our Content View as long as all sides of our Content View are constrained to the edges of our UIScrollView and we have width and height constraints defined for our Content View. If you ever get the error message: "UIScrollView has ambiguous scrollable content" this is because you haven't constrained all sides of your Content View to your UIScrollView and defined width and height constraints for your Content View i.e. if this is not done, Auto Layout literally cannot figure out how big your UIScrollView should be because it doesn't know the size of it's content. Makes sense, right? So we need to make sure that our Content View's height or width is actually bigger than our UIScrollView's at runtime. This tells the UIScrollView and Auto Layout "Hey, you're as wide and tall as the screen you're on, but your content view is actually bigger than that, so i'll let you scroll to be able to see the rest of the content." Because we want to make a horizonatally scrolling UIScrollView, we'll have to adjust the Content View height constraint in the code, but more on that later. For this tutorial, we're focusing on static views. Our ViewController's view (top level view) is currently 600x600 as we're using the SizeClass wAny hAny. Let's make our ViewController's size 'Freeform', by clicking on the yellow 'ViewController' icon on top of our view or in the right hand 'Document Outline' toolbar. Go to the right hand toolbar, and click on the Size Inspector Icon (it looks like a ruler), and select 'Freeform' from the Simulated Size drop down. Now we can resize our view to be any size we want. Let's keep the height 600px, but make the width 1200px. 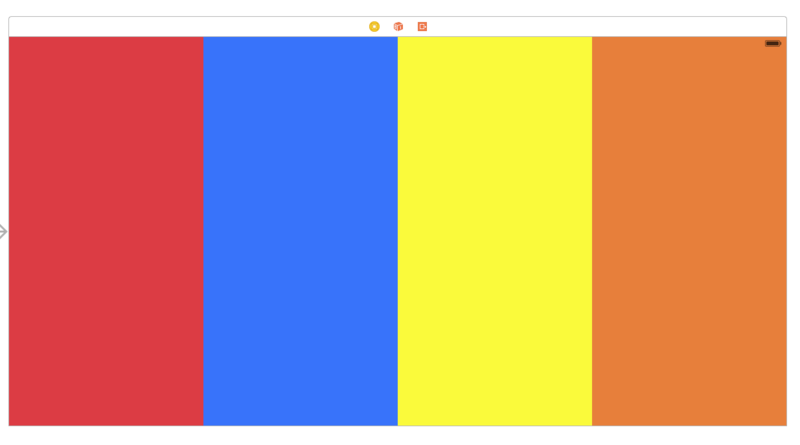 We're going to make a horizontally scrolling UIScrollView. You'll notice that we now get Auto Layout errors, that's because we added a contraint for our UIScrollView to always be pinning to the leading (right hand) edge of the top level view, and now it's not because the top level view is 1200px long and our UIScrollView is only 600px! Don't worry, it's an easy fix. In fact, Xcode will do it for you if you click on the warning triangle, select 'Update Frame' and click the 'Fix Misplacement' button. Phew! 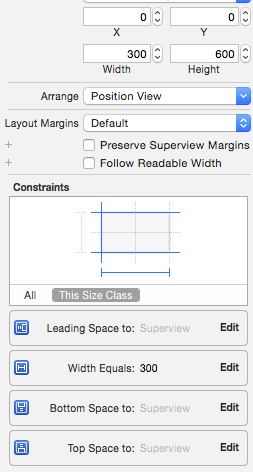 Click on our Content View and then click the Size Inspector (ruler icon) again and modify the width constraint to be 1200px. If your 'trailing' constraint is not 0, set it to 0. It's important to note now, that our UIScrollView will already scroll, and that as soon as we had set the constraints on the Content View, it would scroll because Auto Layout could figure out that our Content View was larger in both Height and Width than our UIScrollView at run time. Don't believe me? Try it out! Run the app on the simulator and you'll see that you can scroll in all directions. But we don't want it to scroll vertically, and our Content View is a bit boring, so lets start by adding some views to our content view. If you ran the app again now, you'd see that we have all of our views scrolling nicely, but we're still able to scroll vertically! Arrghhhhh. Let's fix that right now! Click on the Content View's height constraint in the Document Outline toolbar on the left hand side. There is no Step 10. Our horizontal UIScrollView scrolls beautifully.